A 16-year-old boy who was stabbed in the street in St Leonards on Saturday (November 18) has sadly died, police have confirmed. 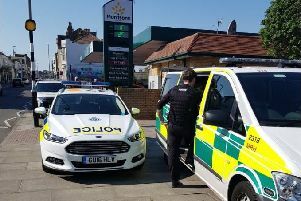 The boy had been taken to the Royal Sussex County Hospital in Brighton following the attack, which took place in Old Church Road, near the junction of Battle Road, St Leonards, at 6.50pm. He had remained in a critical condition throughout. This afternoon (Friday, November 24), his family agreed that his life support should be withdrawn and he passed away shortly after 4.30pm, police said. He has not been formally identified at this time. His death is now being investigated by the Surrey and Sussex Major Crime Team, according to a police spokesman. A resident has said that flowers to the victim are being laid at the bottom of Old Church Road. They were both remanded in custody to appear at Crown Court on Monday, December 18.